Eldorado Golf Club in Cadillac, Michigan has received rightful recognition from respected golf publications including being named as the Best Value in the Great Lakes Area, as well as best place for lunch at a golf facility by Great Lakes Golf. The immaculately groomed layout features numerous elevated tees and gorgeous green complexes amidst a rolling terrain, with lakes and abundant marsh areas connected by 4200 feet of wooden bridges. The penncross putting surfaces average 11,000 square feet, and present a memorable challenge with considerable slopes and subtle but tricky undulations. Being able to chip close to the hole from short distances while reading these greens accurately is a skill that will come in handy, and one that can make a difference of a few strokes here. Most of the greens are sloped back to front, and many run sideways in one direction or the other. Prior course knowledge/experience is a great advantage on this course, as up and downs can be difficult. 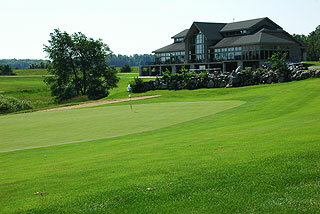 The clubhouse at Eldorado houses a full service pro shop, with Titleist club fitting available. There are separate men's and women's locker rooms with showers. The Cadillac Grille offers award winning casual fare and ambiance that will satisfy golfers, and also features facilities that can accommodate large groups for banquets, outings, conferences, wedding receptions and special events. You can enjoy an evening entr�e or cocktail in the dining room or on the spacious deck. The views from the clubhouse, especially of the 18th hole, are stunning. 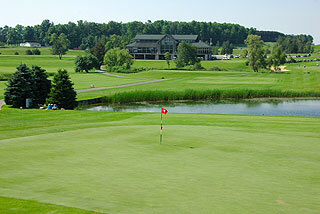 The practice facilities include an ample grass range and a huge putting green, where chipping is also allowed. On course the yardages are measured by marked sprinkler heads as well as boulders placed on the sides of the fairways. Pin placement locations are designated by small flags as well as color coded pin flags (black flags for front positions, red for middle, and white for back). The well sculpted tee areas have measurements to the center of the green provided for on each box. At 6836 yards and a 137 slope, Eldorado's Steel tees demand the best from scratch golfers. The Power tees measure 6387 with a 128 slope, while the Chrome are 5880/117. We opted to play the Power on the front (3006 yards), although the Steel tees are also playable from 3195 yards. The Chrome tees measure 3068 and the Power 3381 on the back side, which plays much longer from all five tee boxes. An intermediate tee (Ride) plays to a 127 slope for ladies, at 5232 yards, and the Comfort (forward) tees measure 4923 with a 115 slope rating. With 5 sets, every player should be able to choose a distance that is conducive to their abilities. 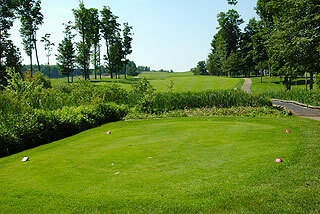 Hole number one is the top handicap as it plays to a narrow fairway with a marsh fronting the green about 60 yards away. The approach is all carry. The second plays over a partially hidden water hazard - you must reach to at least the 150 marker to be safe. The third is a pretty par three - another carry over water. Aim to the right of the left fairway traps on four, as the slope of the mounds will guide the ball back towards the center. Land on the fairway and this is a very score-able hole. The par four 5th also features a short carry off the tee. Be wary of the pond short right which juts out towards the fairway on that side about 90 yards out. 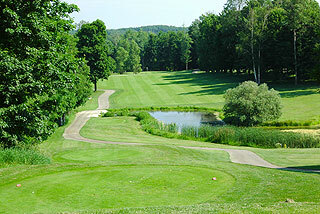 There is a generous fairway off the tee on six, but the approach narrows to an especially tight green complex. This also is a good scoring hole. After a simple par three, the relatively short par five 8th throws some curves. 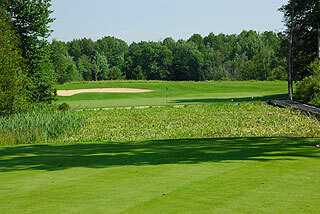 A swamp about 115 yards out comes into play - do not be short on the approach. A shot banking off the grass wall behind the green creates an exciting option. The ninth doglegs left but a shot placed to the left center of the fairway leaves the clearest approach. A pond just short left of the green also curls in front to that side. A drive past the clubhouse leads to the tenth, a mid length par five that presents a great birdie opportunity. 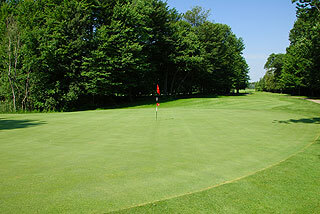 The putting surface that slopes towards the front and also left to right is the main obstacle here. The elevated tee on 11 leads to a narrow fairway, with the right side being the preferred landing area. Twelve is another all-carry par three, this time with a marsh fronting and a sand bunker in back of the green. This precedes a tough par four that is a completely different hole from the white tees (323 versus 438 from the blues). 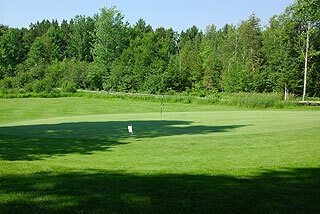 A pond comes into play just short and right of the green, which is severely sloped back to front. The 14th is straight and score-able, and is followed by dogleg right par four that requires a lay up just right of the cart path. Pay attention to the yardages on the tee boxes, which denote distances to the end of the fairway. This info is provided on many of the trickier holes...nice touch! There is an ample fairway on number 16, which is the longest hole on the course. 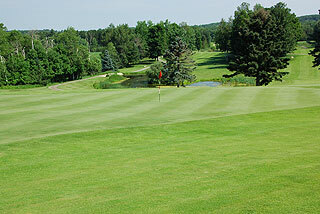 The approach, with a tall white pine left and green side bunker right, is quite challenging. Another par three - and another tee shot that is all carry awaits on 17. Players that can hit high, soft landing irons will have an opportunity to score well on the 4 par threes at Eldorado. The finishing hole is a tough one...A long and accurate tee shot will leave a long to mid iron, and perhaps even a fairway wood approach over a considerable water hazard - with not much room for error. A strong start on number one (# 1 handicap) and a finish that is likewise on 18 (# 2 handicap) - sets the tone and can make or break your round. This is a great layout - that can be as playable or as challenging as you desire. Choose the correct tees and have at it. Eldorado is very conveniently located just off Highway 115, 1/4 mile north of 131. Look for the sign with an Eldorado automobile - which is placed high at the top of the tree line on the south side of the street (left side when coming from central Michigan). Make a left and you will run into it. Highly recommended by the twoguyswhogolf!